The new year has come and our wedding as we know it is officially around the corner. It is hard to believe that nine months have gone by since our engagement! Nine months already? How! Only four short months to go and the big day will be here! I can not wait!! I can honestly say I have enjoyed the whole wedding planning process. It definitely came with its challenges, emotions and stress but in the big picture it has truly been an enjoyable experience being able to take a space and transform it into our dream wedding. One of the things I have enjoyed most alongside wedding planning is being able to relate with my current brides. I feel like I have been able to offer so much more advice being a bride myself. We’ve been able to share our experiences and ideas back and forth. It’s given me a new found friendship with some of these girls that might not have been this close if weren’t for both of us planning. 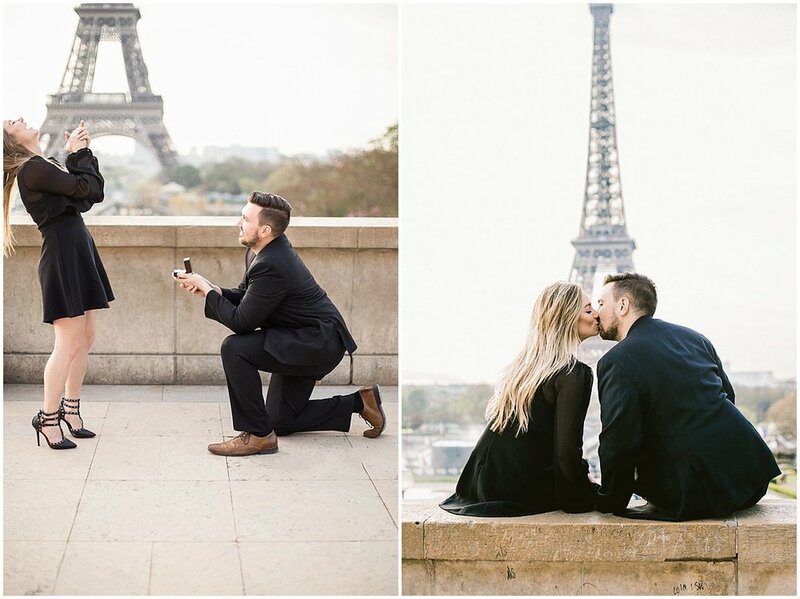 Below is a roundup of our favorites from our early morning in Paris + surprise engagement! (read how we got the photographer and why we were dressed up at the end of the blog). Back story! Because it is always the number one question. Daniel gets to travel for work quite often and when our schedules align sometimes I am able to jump on a flight and join him for a few days. Paris is my favorite place in the whole wide world! The city, the beauty, the way of life, the history. I could go on and on. Because of this I have been to Paris a few times… a few times too many. I could really be your personal tour guide at this point! But really, hotel recommendations, places to go, things to see… I’m your girl! Any-who Daniel had a trip coming up and I said… I am coming. He laughed, being it was only a few short months away but was not surprised in my eagerness to go back. He sat me down one day leading up to the trip and said Paris again? Don’t you want to save miles and see other places? You’ve been so many times, are you sure you want to go again… my answer was still YES I’M GOING. He agreed and we booked my flight. The agreement was if I go this is the last time for 5 years! (Little did he know I would be going again at the end of 2018… thats for a later story!) So I said okay that is fine BUT if this is my last trip to Paris I want to get photos done so I can have canvases for the house. It is very popular for tourist to set up photoshoots while on vacation. ESPECIALLY in Paris. This made finding a photographer very easy for me. I found a great girl, booked her and the day came! The best part of it all was Daniel never tried to contact her. He didn’t tell her his plan. He played it out and waited to pop the question when we were at the best spot. She was surprised… I thought it was going to happen on a camping trip in UTAH! WHAT?!? There were tears, excitement and I don’t remember anything else that happened that day. It was all a blur! 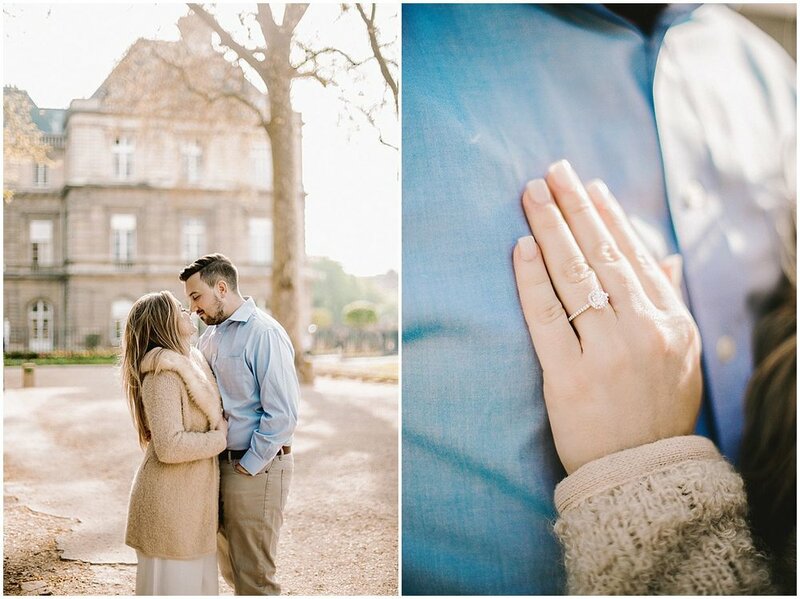 I still can’t believe it happened, that he was able to pull it off and ESPECIALLY that he was able to hide a ring from me in our hotel rooms in both Germany and Paris for a week prior!